I’m a little late with this announcement, but better late than never I guess. 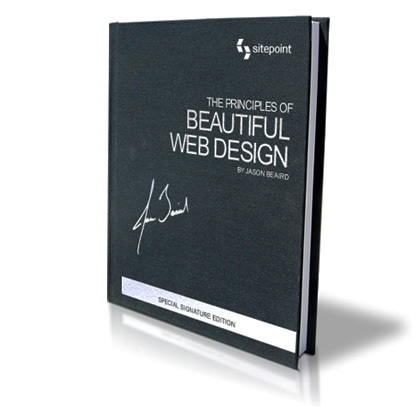 Sitepoint printed a limited number of “Hardcover Signature Editions” of The Principles of Beautiful Web Design! Not individually signed, but next time I’m up your way I might hit you up to sign my copy once it arrives 😉 Congrats on this special btw. The photos make it look gorgeous. Are you meaning to say they decided to do this special hard cover without you even knowing about it? That’s bizarre. If youï¿½re happy to individually sign 500 books then we could do that ï¿½ it would take a long time, though! I was thinking more that weï¿½d just get it printed with your signature. Iï¿½m having a look at different book styles now. It was Sitepoint’s Photoshop touches, Marko. 😉 Hopefully the real thing will look this good too – if you set it on a glossy white table in a big white room. I’m excited. They should be coming soon! I’m getting some kind of strange of graphical glitches on the site. Words being cut off etc. For example, at the end of your post I get “Sorry to d”, the rest it cut off. Don’t know if it’s me or you 🙂 Just thought you would like to know. Thanks for the heads-up, Travis. I guess you’re using IE and that the bottom-right corner image is overlapping the word there. I’ve known about that bug and a couple others for a while. They’re mostly easy fixes, but I’ve been putting them off with the intention of doing a full redesign. Haven’t found the time for that yet, so I guess I need to squash some bugs. Even though I already own a copy (tracking it down has become difficult due to the kids relocating it) it would be great to have a hardbook edition. By now these are probably sold out, but if Sitepoint ever decides to do another run I think I’ll grab one. Also, it’ll be “super-awesome-killer” to meet you at SXSW this year. You seem like a stand up kind of guy and I admire that. I doubt they’re sold out yet because the “Only 50 Left” badge is still up on the book page. (Scratches Head…) Anyway, I look forward to meeting you too Erik. SXSWi 2008 is going to rock!